Office water coolers aren’t just a clichéd place for staff to hang out and discuss who’s running for mayor in Bundaberg or tips for staying safe in the next flood – they’re actually a proven way to keep employees working smarter and healthier. That’s right, just by installing an office water cooler you’ll have happier, faster and smarter staff who take less sick days off work! What’s more, installing a water cooler in your retail store or reception area for customers to use instantly improves your kudos with the hot and sweaty public during a Bundaberg summer. By giving employees access to an office water filter they’re less likely to grab sugary drinks and snacks from the nearest vending machine in an effort to keep their brains firing on all cylinders. This means no more glazed eyes and slack jawed staff come 3pm. Drinking more water has been proven to keep people working smarter. In a 2013 study published in Frontiers in Human Neuroscience, researchers found that drinking water and improving hydration resulted in increased reaction times. The same study found dehydrated people were more likely to be tense, sad and confused. 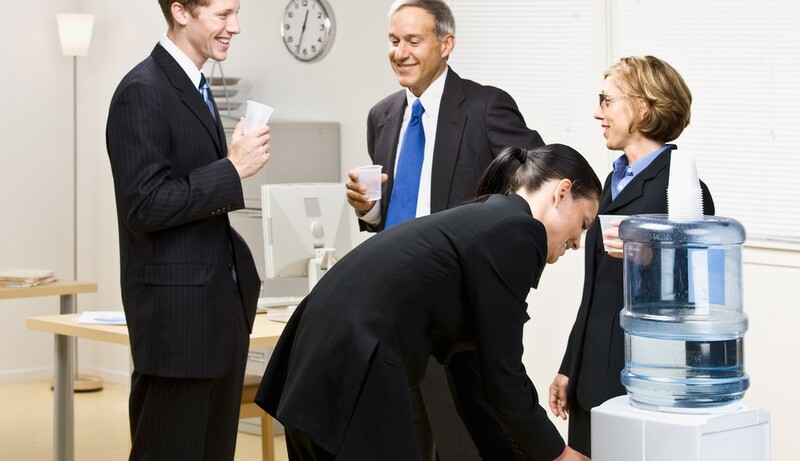 Installing an office water cooler may be the answer to a more efficient and harmonious work environment. Don’t just seal the deal with a handshake, offer your customers a refreshing glass of pH balanced pure water from your water cooler. A water cooler with hot water for making tea and coffee is also a great way to keep waiting customers happy and distracted if you’re running late for their appointment. Don’t force your employees to drink horrible tap water or waste their money and contribute to land fill by buying single use plastic water bottles. Be the better boss and foster a workplace culture that promotes and supports health and wellbeing. Encourage your employees and customers to reach for a glass of refreshing and healthy purified water or cup of tea from the water cooler instead of high sugar soft drinks and juice. You’ll be rewarded with happier more productive staff. If you’re in the Bundaberg, Wide Bay region and you’d like to know more about the benefits of installing an office water cooler, contact the friendly, helpful and well hydrated team at So Fresh and they’ll be more than happy to help you find the best option for your office or work place. Want to learn more about how office water coolers can improve productivity in your Bundaberg business? Contact So Fresh today!